Viewing 24 of 36 items. 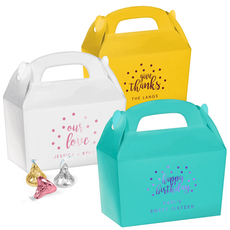 These personalized large favor boxes are perfect filled with the favor of your choice for your party guests. 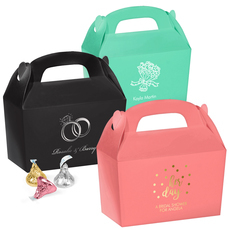 Personalize the boxes with your monogram or initials, a Valentine's day or heart design,.. 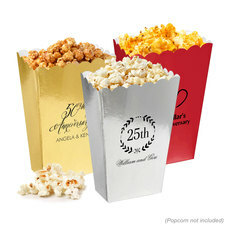 These personalized mini popcorn treat boxes are perfect to serve popcorn or other treats at an anniversary party. The boxes have a classic scalloped edge along the top. Personalize them with a.. These personalized gable boxes are perfect to use at a birthday party or other celebration. 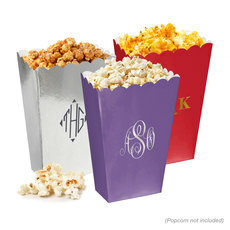 Personalize the boxes with your monogram or initials, a birthday design, and/or a short phrase. Your.. 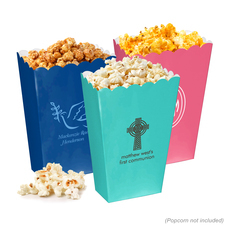 These personalized mini popcorn treat boxes are perfect to serve popcorn or other treats at your celebration. The boxes have a classic scalloped edge along the top. Personalize the boxes with a.. 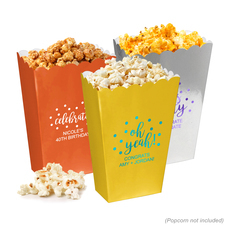 These personalized mini popcorn treat boxes are perfect to serve popcorn or other treats at any celebration. The boxes have a classic scalloped edge along the top. Personalize the boxes with monogram.. 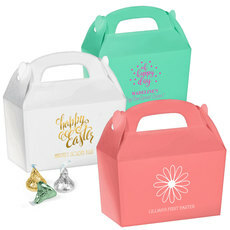 These personalized large favor boxes are perfect to use for baby showers. Personalize the boxes with the baby's name or monogram, a baby design, and/or a short phrase. Your choice of box color and.. 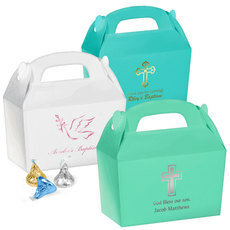 These personalized gable boxes are perfect to hold a favor or little gift of your choice for family and friends at Easter. 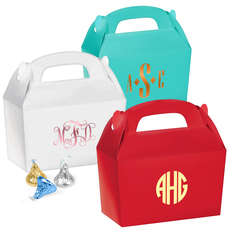 Personalize the boxes with a monogram or initials, an Easter design, and/or.. 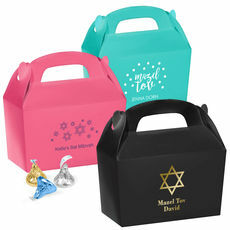 These personalized large favor boxes are perfect as gifts for guests, filled with your choice of favor) at a celebration after a Baptism. Personalize the boxes with a monogram or imprint of your.. 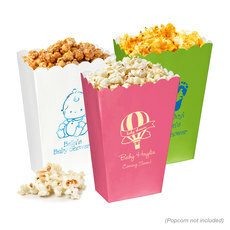 These personalized mini popcorn treat boxes are perfect to serve popcorn or other treats at a dessert table. The boxes have a classic scalloped edge along the top. Personalize the boxes with a.. 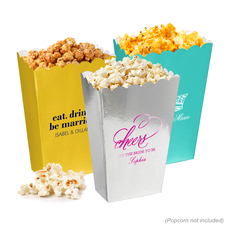 These personalized mini popcorn treat boxes are perfect to serve popcorn or other treats at bridal showers. The boxes have a classic scalloped edge along the top. Personalize the boxes with the.. 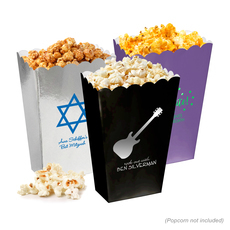 These personalized large favor boxes are perfect to hold a favor as a gift for your bar mitzvah or bat mitzvah guests. It's very nice to provide the favor at the luncheon or dinner for the guests to.. 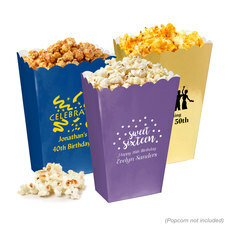 These personalized mini popcorn treat boxes are perfect to serve popcorn or other treats at a birthday party. The boxes have a classic scalloped edge along the top. Personalize the boxes with a.. These large personalized favor boxes are perfect to hold a favor of your choice as a little gift at the celebration after Communion. 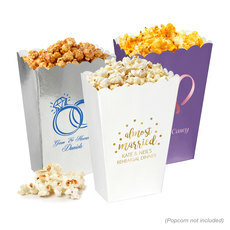 Personalize the boxes with a monogram or initials, a religious..
Adorable personalized mini popcorn treat boxes are perfect to serve popcorn or other treats at baby showers. The boxes have a classic scalloped edge along the top. Personalize them with the baby's.. 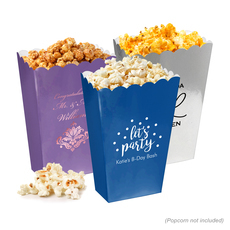 These personalized mini popcorn treat boxes are perfect to serve popcorn or other treats at the celebration after Communion. The boxes have a classic scalloped edge along the top. Personalize the.. Create a very special little personalized box for your upcoming event. Print the bride and groom's names for a wedding, the original wedding date for a 25th anniversary party, a monogram for a man's birthday, a cross with child's name and baptism date for a religious event, or a welcome to your guests at a Thanksgiving dinner! 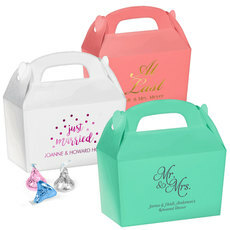 A personalized favor box is a wonderful little surprise for your guests. Consider filling the boxes with chocolate kisses, nuts, hard candies or mints as a welcomed accent at the guest's table place, placecard table or a special location when the guests leave. Perhaps you might like a special favor filled with a treat to put into out-of-towner welcome bags at the hotel if you are hosting a hotel wedding or celebration. No party is really complete without a personalized favor! A little favor goes a long way to make a lasting impression. 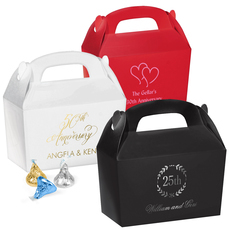 Make a big hit with very little effort and order a personalized favor box with the imprint and color that represents your occasion. 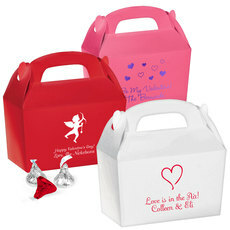 We offer a collection of favor boxes in solid colors and your choice of imprint color to match your theme. Of course you'll find gold and silver, but you'll also find some wonderful fun imprint colors too. Simply fill with Jordan almonds, M&M's, homemade toffee, little homemade cookies or Nonpareils which everyone loves! No need to add a ribbon or charm, the box is already finished and perfectly printed for your guests.